Where do rotten apples go after they fall off the tree? Does the temperature of the wood affect the heat of the fire? Can you make water boil faster? How large a mirror do you need to see your whole body? 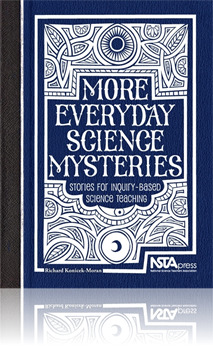 This second volume of 15 mystery stories examines more science concepts and reinforces the value of learning science through inquiry. Each mystery presents opportunities for students to create questions, form hypotheses, test their ideas, and come up with explanations. Focused on concepts such as weather and climate, thermodynamics, interdependency of living things, adaptation, life cycles, properties of matter, reflection and refraction, and chemical bonds, these mysteries draw students into the stories by grounding them in experiences students are familiar with, providing them with the foundation for classroom discussion and inquiry. honestly,i'm not familiar in this subject matter may i know more information on this? and help me also how to implenment in my elementary students teaching science. Thank you so much for your help! God bless!